Almost 1kg of healthy chicken-based reward snacks. Superb value for money. Easy to break for small breeds and puppies. Gentle on sensitive stomachs..
Husse Reward snacks conteract tartar, contributes to a good breath and is dye free. It does not smell and is non-sticky and is also easy to digest for your dog. 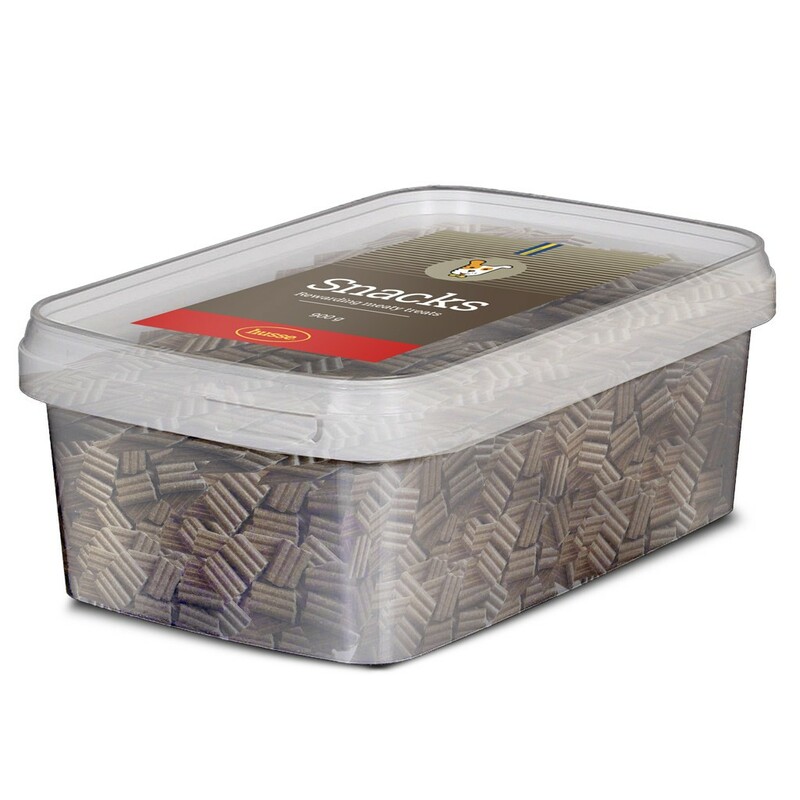 Keep the box dry and at room-temperature. Chicken, corn, wheat, oil, fat, protein extract from plants. Crude protein 25.0%, crude fat 8.0%, crude ash 7.0%, crude fiber 3.5%, calcium 1.6%, phosphorus 1.1%, sodium 0.3%, carbohydrates 46.5%. Vitamin A: 13 500 IU, vitamin D3: 1500 IU, vitamin E: 50 mg, Vitamin B1: 5 mg, vitamin B2: 7 mg, vitamin B6: 5 mg, vitamin B12: 25 mg, vitamin H: 250 mg, vitamin K3: 3 mg, carbonic acid 2mg, flax oil 8 g, niacin 50 mg, pantothenic acid 20 mg, choline 300 mg, copper (copper sulphate) 17 mg, iron (iron sulphate) 325 mg, zinc (zinc sulphate) 3 mg, calcium iodic 1.5 mg. Energy: 1331 kj/100g.